[…] Ghassan Ben Jeddou: But I want to return to the United States, as a fact of utmost importance just occurred, Eminent Sayed, on the general and strategic perspective: Trump said he would withdraw (US troops) from Syria, saying that the country was nothing but “sand and death”. My specific question is this: is it (just) a tactical withdrawal, meaning that the United States will withdraw (just) a part of their forces to leave you in a quagmire? Or is it a true (and full) withdrawal, which means a defeat for the United States? Hassan Nasrallah: I think whenever Trump talks about his intention to withdraw US forces, he is true and sincere. The word “sincere” (applied to Trump) makes you laugh? I mean he is honest with himself (he says what he thinks). During his campaign, he made election promises, and after two years there will be new presidential elections. And everything he has promised to do, he wants to do it. In fact, he already achieved some of his election promises. Ghassan Ben Jeddou: 7 trillion dollars. Obama… sorry, Trump is a charming person! When we listened to Obama, he spoke about human rights, democracy, (free) elections, etc. His attitude and his words were steeped in hypocrisy. 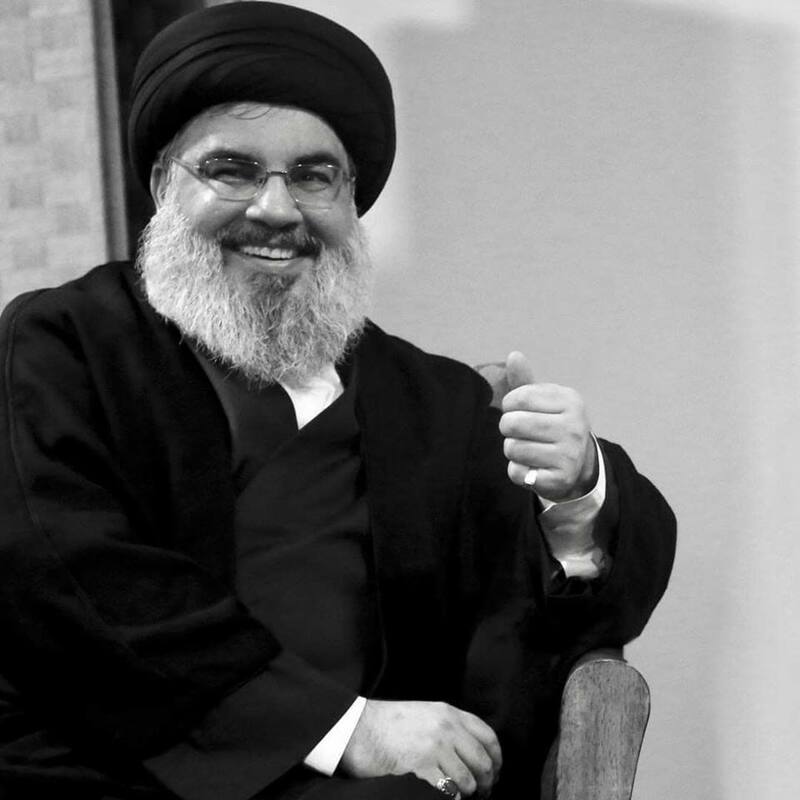 Hassan Nasrallah: We’ll come back to this point. From day one, all we hear from Trump is “millions, billions, dollars…” I’m relearning English (thanks to him), you see… And “They have to pay, they have to pay, there are both rich and poor people among them, etc.” Very well. That is why he hasn’t respected anyone in his statements. He was very insulting to Saudi Arabia, and in respect to the Gulf countries in general, including his closest allies, such as Europe, Japan and South Korea, (he didn’t spare anyone). As we say in Lebanese, he buried them alive (under his torrent of abuse). He wants everyone to pay all the US expenses, rightly or wrongly, he makes them (spit) money (forcefully), even as he (already) plunders their resources, raw materials, their future, he confiscates their political freedom and imposes them (US) companies, etc., but he doesn’t pay attention to all this. All that matters to him is that he protects them, so they have to pay billions of dollars for this protection. Thus, he is committed to bring his forces out (of Syria, etc.). What is happening today in Afghanistan? Even today, to prove that we are broadcasting live – but it should be enough that you say so, without need for additional evidence –, the Taliban announced that they and the US delegation led by Khalil Zad Zalmai had met in Doha and had reached a draft agreement, which may be renegotiated if necessary, and which stipulates that within 18 months, all foreign forces should have left Afghanistan. That’s (what) Trump (is doing)! And we must keep this in mind and remind it to the others when addressing Lebanon and the peoples of the region, so they know that the days of US hegemony in our region (are counted). We are at a time when we must be careful with translations, and ensure that they are accurate, so I asked a (Hezbollah) brother who had the text of the speech in English to send it to me and highlight the passage where he said “soon, very soon”. (And this passage was indeed saying) “soon, very soon” (quote in English). So the media had faithfully translated his remarks. Everyone went beserk after this statement, with protestations from Mattis, the former Defense Secretary (who resigned in December 2018), and other people denouncing this US withdrawal, which would represent a victory offered free of charge to Iran in the first place, to Russia and to President Assad, a wrong decision, an (ill-advised) visceral reaction, etc. They went to see him. These are important facts that I must relate to you, it is sound information and I could even give you the source. (Mattis, Bolton and others of their ilk) went to see Trump and told him to give them some time. If he was keen to get out of Syria, he should at least give them time to gain (something in the field) in exchange for the withdrawal. Trump said he had no problem with the idea, and asked them how long it would take them. They said 6 months. These 6 months have not been officially announced, but CNN and other US media reported that Trump had given 6 month to his Defense Secretary to prepare the withdrawal from Syria. The Americans went to the Russians and told them… I am sorry to mix the Lebanese dialect and literary Arabic. The United States told Russia that they were ready to get out of all Syria and leave absolutely no soldier behind – I convey their words accurately –, and they were even ready to leave the Al-Tanf region, which has a special significance. Yesterday, a US official said they would leave Syria, but remain at Al Tanf (American base at the Syrian-Iraqi and Syrian-Jordanian border), but back then, they said they’d even leave Al-Tanf, but on condition that Iranian forces leave Syria, and Hezbollah also of course. The United States asked the Russians to go talk to the Iranians and with President Assad to tell them about this agreement proposal, namely an Iranian withdrawal would be carried out together with a full US withdrawal from Syria. And the Americans asserted they were quite ready to conclude such an agreement. Trump was determined to withdraw his troops even without this bargain, but those around him told him to wait a bit for them to get this deal. The Russians have therefore communicated this proposal to the Iranians, and President Putin informed President Rouhani, who informed me myself. Similarly, the Russians sent a high level delegation to Damascus who met with President Assad and conveyed this proposal to him. The Russians waited a response from Iran and a response from Syria. On the Iranian side, I am one of the people they have consulted on this issue, and I told them (that in my opinion), the United States would withdraw from Syria in any case, whether the Iranians remained or left; the US try to get something in return to save face and cover their withdrawal (because in truth, they are defeated), to pretend they leave after scoring a big victory, namely the withdrawal of Iranian forces – because ISIS was not eradicated –, to be presented in the United States as a huge success for Trump, and as an even greater success by Netanyahu in the Israeli entity. Iran has categorically rejected this proposal, saying that they were present at the request of the Syrian government to combat terrorism and takfiri groups, which were still present in Syria. The reason for their presence being still valid, there was no reason to leave. Final point. End of the discussion. President Assad made the same answer, saying he refused that Iran leave Syria – talking about Iranian forces may not be entirely fair, but there are generals, officers, consultants, logistics, etc. President Assad refused on principle to put on the same footing Iranians and Americans, because the first came at his request, and the second are occupants. “The first are friends and the latter are supporting my enemies, (he said). The battle is not over, and even if the Iranians wanted to leave, I would not accept it, and I would ask them to stay.” This US project has failed. To be honest, it should be noted that the Russians haven’t put any pressure on Assad (for him to accept this proposal), they only conveyed the message. For you know that in the media, there is much talk about the Russian-Iranian issue (to present an alleged divergence or opposition in Syria). It is true that the Russians sometimes exaggerate (in their demands, and exert too much pressure), but to be fair and accurate, (this time), the Russians have only transmitted a message, and in an appropriate (and respectful) way. They said that there was this proposal, and asked (Iran and Syria) their opinion. And when both answered no, this response was forwarded to the US. End of story. Trump was informed that the attempt had failed, and he began to ask them to work seriously to liquidate ISIS because they had only 6 months. This is why recently, operations and bombings against ISIS intensified and real massacres were committed to end ISIS in this last pocket of the Deir Ezzor region where they are present. When 6 months have passed, Trump surprised no one (when announcing the US withdrawal from Syria). Mattis, the Defense Secretary, and other officials, had known for 7 months that they only had 6 months before them. You got nothing, you’ve done nothing, so the guy (Trump) decided to leave Syria. Why does he leave Syria? I’m coming to it. He said there was only sand and death (there), nothing else, and that he had no reason to stay. In his eyes, the Syrian people has no value, he couldn’t care less about the future of Syria – and there is even a positive aspect to this. Neither elections, nor freedom, nor democracy, nor any of this interests him. Ultimately, what does he care about in Syria? He cares about Israel, and perhaps about some red lines, some limitations and some (armed) groups. And he believes that he can guarantee his interests through the political hegemony, the political resolution (of the conflict in Syria), pressures, etc. And he also said something (important): the US Air Force retains its undisputed presence in the Syrian skies. When Trump bombed Damascus after the chemical masquerade, where did his aircraft come from? It came from Qatar and the Mediterranean Sea, from their Al Udeid base (in Qatar) or whatever. Trump does not need to have a military presence in Syria (ground troops) to pursue his military pressure (and stay active and influential). He can do it from his other bases. So he can get out of the Eastern Euphrates region and thus achieve one of his election promises. But this withdrawal also reflects a failure. The idea to withdraw troops from Syria, Afghanistan and Iraq, the reduced number of troops, reconsideration (of their doctrine) are in fact a new strategy. This is what I call the Trump version of the American (hegemony) project. At 1-26-2019, a bit dated already, but nonetheless a worthy — interesting, intriguing — read. Sayed Hassan Nasrallah has always reminded me of the persona, patriotism, uncorrupt leadership, and fire of the youngish Iraqi cleric (I probably have his name mis-spelled) Muqtada Al-Sadr [both Shia, I believe]; I wonder what has become of him? They seem like kindred spirits and natural allies to me in the regional quest for release from colonialism, uplifting of their people…more such are needed in the Muslim world. Looking forward to Part 2 with hope for more satisfying results from the nexus of resistance to USZioraeli schemes for full-spectrum regional dominance. Perhaps the Palestinians’ torment will be addressed. Also the Golan Heights….